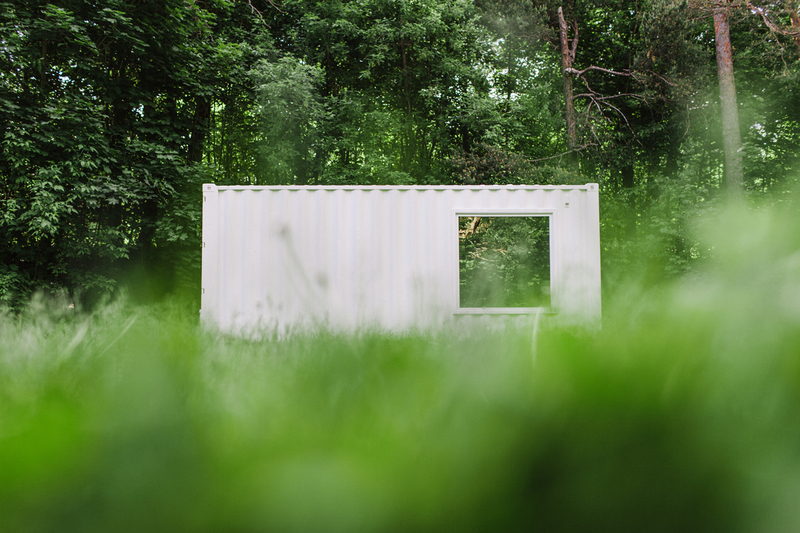 To separate itself from high-end downtown retail, Toronto clothing label NEEDS&WANTS kitted out a shipping container as a showroom and concealed it in a North York park. The 160-square-foot store will travel to new locations around the city this summer, before migrating to Miami and Brooklyn in autumn. The experience provides customers a temporary point of access to the mostly online brand. Recent architecture graduate Marco Lee conceived the layout of the windows, which are from Glasshaus Living. The interior of the container is warmed by parquet flooring and Finium wood panels. NEEDS&WANTS had to select furniture carefully to save room for their wares. A vintage suede sofa, imported from Lean on Rack in Belgium, sits beside an adaptable Offi Mag table. Brand clothing designer Sean Brown notes that, due to the showroom's limited size and accessibility, "the idea is to point all transactions back to our online channel." For many retailers, the value of a brick-and-mortar presence is its dependability: Customers know when and where they can go to browse products firsthand. But for online sportswear brand NEEDS&WANTS, whose first showroom launched this month, a physical store represents another chance to celebrate the spontaniety of the the digital world. All that the company has said publicly about its inaugural location so far is that it can be found in a shipping container in an unspecified Toronto park. Tracking it down is a challenge to fans, one made even trickier by the fact that the container is portable and will roam across the city, and eventually the United States. To find its exact whereabouts, followers of the clothing label can sign up for a newsletter. "Existing customers will adventure to the space," says brand clothing designer Sean Brown. "Potential customers, we hope, will be intrigued."